Jamaican hot sauce is a great culinary gift to the world and it is all over the island. The combination of hot spices that are aromatic and enticing are added to Jamaican foods at roadside shacks and also into elaborate dishes at upscale fusion restaurants. If you want to know how this sauce is made, well we each have a special recipe so I am sharing my own special, flavorful and delicious ingredients. 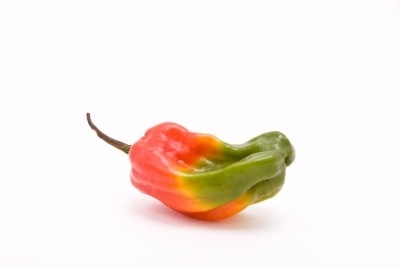 One of the essential ingredients in this sauce is the Scotch bonnet pepper. Scotch bonnets are small hot peppers that come in an array of colors like yellow, orange and red. Too much of this pepper will inflame your mouth but it is truly flavorful. I also add onions, scallions, thyme, soy sauce and salt to season the meat and leave overnight in refrigerator. Instead of making your own Jamaican hot sauce you could purchase a bottle of this Walkerswood Traditional Jamaican Jerk Seasoning, 10 oz . This jerk seasoning rub should be used sparing when rubbed into meat or fish and left overnight in refrigerator. Then grill or bake. Remember adjust the amount of rub you use according to your taste. The ingredients for this rub are scallions, scotch bonnet peppers, salt, black pepper, allspice, nutmeg,citric acid, sugar and thyme. Hot sauce really refers to the special spices used to season the meat as well as the method of how it is cooked. Usually you will see the meat cooked within drums by the roadside but it can also be cooked in an oven and be just as delicious. When in Jamaica you'll see mostly on the weekends a lot more roadside jerk stands filling the air with its flavorful smoke. 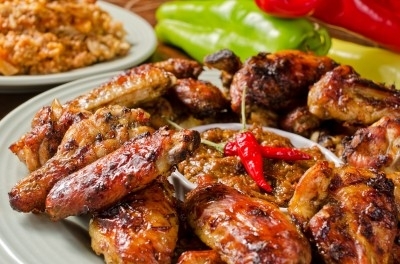 Chicken wings are eaten a lot as appetizers or prepared as a main meal. So preparing it with any of the above jerk sauce will be something new for you and your guest to taste. It can be seasoned overnight and placed into your oven to bake for 45 minutes. What makes our sauces so flavorful are the influences of our heritage from the Spanish, African slaves, the Indians, the Chinese and our European touch all mixed in together for both our delicious and completely original cuisine. Enjoy and let your taste buds run free.